30 days prior to arrival group cancellation/late amendment policy. The Princes Square is a London townhouse hotel located in the trendy Notting Hill area. 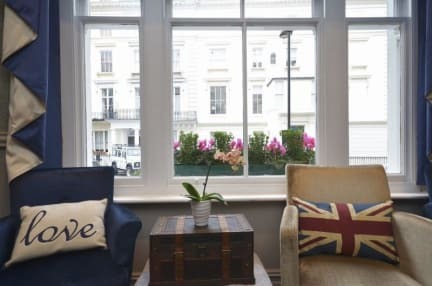 Here you will find a combination of traditional features like the Victorian white colonnade faade on the outside, and modern, clean and comfortable accommodation inside. The hotel's friendly and courteous staff have years of experience and will be happy to assist you with any of your enquiries. The hotel's facilities include a concierge, multi-lingual receptionists, a lift to all upper floors and fax/photocopying services - all of which are available to you 24 hours a day. Its central location makes it a gateway to local tourism hotspots including Oxford Street, Madame Tussaud's, Buckingham Palace, and the world renowned West End. The Olympia & Earl's Court Exhibition Centres are also located nearby. You can also walk to the world-famous Portobello Market where you can browse through historic galleries & arcades. If you fancy a quiet retreat then visit the famous and beautiful Kensington Palace Gardens or Hyde Park which is just 5 minutes walk from the hotel. The hotel is well served by public transport. There are several bus stops nearby and the Bayswater (Circle & District Line) and Queensway (Central Line) tube stations are each within 5 minutes walk from the hotel. Guests arriving at Heathrow airport may wish to take the Heathrow Express to London which will deposit them at the nearby Paddington Train Station in just 15 minutes. If arriving by car you will be pleased to find free on street parking is available from 6.30pm to 8.30am (Mon-Fri) and from 1.30pm to 8.30am (Sat-Mon). In addition to this there are NCP car parks nearby. 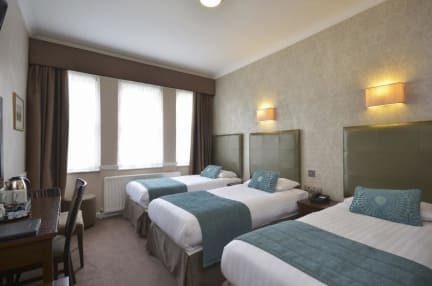 The Princes Square Hotel is an ideal place to stay in London whether you are on business or leisure. Your card will be pre-authorised for the first night to secure your reservation.